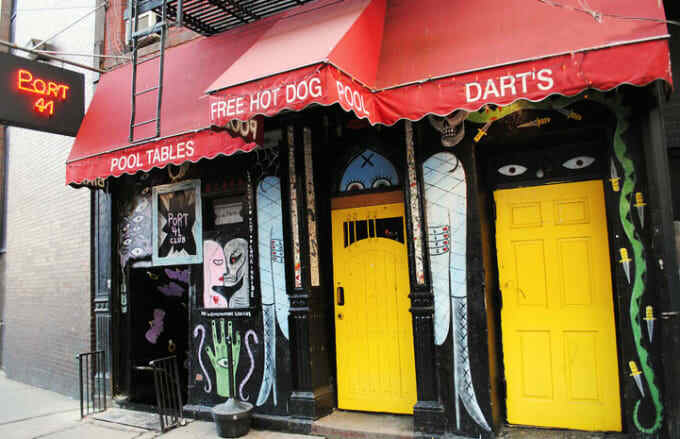 Address: 355 West 41st St.
Bikini bars are strange. Port 41 is a bikini bar, thus Port 41 is strange. Amidst bottles of booze, free popcorn and free hot dogs, the bartenders will be moving about wearing bikini tops. They don't take the tops off. They don't dance. They wear a bikin while they do regular bartender things, like pouring your drink, bantering with regulars, and telling people that the top stays on (this is only a regular bartender thing at Port 41). The clientele is a mixture of men that appear to have no other commitments in their lives and Port Authority commuters. Everyone agrees that the $3 Bud happy hour special is a nice, generous thing.